What can be said about the Serengeti that hasn’t already been said? This is simply Africa as you always imagined it. Endless rolling bleached grasslands with scattered flat-topped acacia trees and animals everywhere. This is the Tanzania’ mirror image of Kenya’s Masai Mara and it’s physically much the same but on a much larger scale. Kenya’s Masai Mara is probably my single favourite park in Africa but the only reason it beats the Serengeti is because I know it better. If I had to choose between the two though, then it would simply come down to the time of year. Between roughly late-October and early June the Serengeti is home to over a million wildebeest and thousands of other grazers, but from June to October the majority of those animals head north to the Masai Mara in what’s known as the wildebeest migration. My decision as to which of the two parks would basically come down to where the wildebeest were at the time of my visit. Whenever you visit the Serengeti you’re guaranteed a lifetime of memories. All of the Big Five are present, but while rhino aren’t that easily seen, lions are common and if you’re staying in one of the smaller, quieter camps then there’s a better than average chance that their deep throaty roars will seep into your dreams at night. Nerve wracking the first few times it quickly becomes a noise you’ll relish. Parts of the Serengeti can get busy, especially the central Seronera zone which has the easiest access and highest concentration of camps and lodges. But it’s not hard to get a great slice of the Serengeti to yourself. Indeed on my last trip to the region (April 2016) to the far northwest of the park I actually didn’t see another safari vehicle for three days. The far east of the Serengeti is also very quiet and in the Namiri Plains, an area that until very recently was closed to all but scientists and park staff, there’s actually only one camp which means that absolute solitude is almost a given. The western corridor, the humid, fairly wet, finger of land that almost touches Lake Victoria, can also be much quieter than other parts of the park. As well as looking at where the wildebeest will likely be at the time of your visit it’s worth considering what you yourself want out of a visit. This is a national park and so rules on what is and isn’t allowed are generally much tighter than in the nearby Ngorongoro Conservation Area (off-road driving isn’t allowed here which can make for some rather distant, and frustrating, wildlife viewing), but in some areas and from some camps short walking safaris can be arranged – a wonderful way to view the Serengeti. For this, I would strongly suggest the Namiri Plains area as the most pleasant area to walk. To really get the most out of the Serengeti you need to allow plenty of time. This is a massive park and the landscapes, environments and wildlife differs from north to south, east to west and season to season. Ideally it’s best to allow time to see a bit of every area and allow for some rest days, but even if your schedule does only allow for a few days in the Serengeti you can rest assured that it will be a couple of the most memorable days of your life. Serengeti is Tanzania's most visited park, and with good reason. Almost from the moment you enter the gates, wildlife surrounds you in astounding numbers and variety, together with an incomparable sense of space. The headline event is the annual wildebeest migration, and being able to witness a part of this (which takes both planning and luck) is an unforgettable experience. The Serengeti is also known for its high density of predators, and the chance to watch lions and other cats - often at very close range - is another treat. I also like the Serengeti's quieter side - its wealth of birds and its nature-filled stillness. 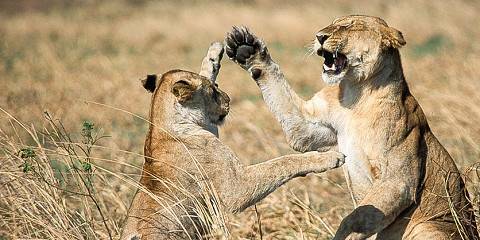 Most shorter safaris concentrate on the well-visited central Serengeti. With more time (and depending on the season), I’d also recommend spending at least part of your Serengeti itinerary in the western corridor around the Grumeti River or in the far north. With its natural splendour and greatest concentration of game you are ever likely to see, the Serengeti is faultless as a safari destination. The vast ecosystem features rolling golden plains, intricate river systems, the Big Five, and the annual wildebeest migration is the largest single movement of wildlife on earth. After many visits, and in each of the seasons, it never fails to surprise me. Massive crocodiles lick their thickset jaws in anticipation in the Grumeti River, large prides of lion move stealthily through the long grass on the savannah, leopard loll in acacia trees, cheetah sun themselves on the flat rocks of the distinctive kopjies, and many thousands of grunting and snorting wildebeest gather in their masses; the weak at the tail end of the procession, and the patient, vigilant predators hot on their heels. For me, the drama of the Serengeti’s animal action is simply unrivalled. One of the best game reserves in the world, the Serengeti is without a doubt my all-time favourite game park. The Serengeti is one of those places that had long lived in my imagination, before I’d even laid eyes on it. Happily, it more than lived up to my expectations – in fact, it surpassed them. With sweeping savannahs that seem to stretch on and on forever and an ever-changing parade of animals, there really is nowhere else on earth like it. What’s more, if you time your trip carefully you can witness one of the world’s greatest natural spectacles: the annual migration. Watching as an endless stream of wildebeest and zebra driven by a deep-rooted instinct darken the vast plains in a long dust-raising column in search of greener pastures is in a word, mesmerising. But it was when I witnessed the frenzied crossing of the Grumeti River where gigantic crocodiles lay in wait for hesitant or feeble to stumble, that I truly felt like I was caught in the middle of a National Geographic wildlife special. Beyond the migration, I’ve had plenty of other magic moments is the Serengeti: spying a pride of lions feasting on a kill, seeing a leopard laze languidly in the crook of a tree, watching Hyenas fight over scavenged leftovers, witnessing the sunrise over the veld as a hot-air balloon silently drifted by, and waking up in the middle of the night and unzipping my tent to find the Southern Cross lighting up the night sky. All I can say is: asante sana! The Serengeti is Africa run completely amok! If Ngorongoro is a sort of condensed Africa all confined in one little area then the Serengeti is Africa run completely amok! The unforgettable thing about the Serengeti National Park is that it gives such a vivid impression of the sheer, mind-boggling, unfathomable size of the African wilderness. You can drive for several hours across the spellbinding immensity without seeing much of anything - a couple of scavenging hyenas maybe, or a topi on an anthill - then suddenly you are in the midst of a mass herd of wildebeest. We happened to be in Serengeti just as the calves were dropping prior to the migration and saw a herd of wildebeest that was probably 20,000-30,000 strong. Within the first two days in Serengeti we saw both lions and cheetahs on the kill. And our tented camp was visited by roaring lions. The Serengeti is that rare thing – a traveller’s icon that actually lives up to its reputation. If you do it right, this most visited of parks will give you the classic African safari experience you’ve been dreaming of. I’ve found the key to getting the most out of the Serengeti is to research the migration patterns of the animals before you visit, then target the areas of the park that have the greatest concentrations of game at the time you’re there. Yes, the park’s southern plains are both beautiful and accessible, but they are also empty for parts of the year, when the wildebeest and zebra (and the predators that follow them) migrate north. The area around the park headquarters at Seronera (where most of the reasonably priced tourist lodges are), can get very overcrowded with game drive vehicles, which tend to follow each other around, meaning you’re unlikely to get much one-on-one time with the animals you find. If you can afford it, head to the lodges and camps around the Grumeti River at the same time as the herds. You’ll be rewarded with views of green plains teeming with animals, and perhaps even the legendary river crossing, complete with giant crocodiles. During migration season herbivore populations explode as wildebeest and zebra arrive in their hundreds of thousands. The cacophony that accompanies the plodding herds, drawn forward by the promise of life-giving rain and fresh grazing, is indescribable. Lions and other predators trail behind the herds, picking off old, weak and sick animals with consummate ease. The migration is a spectacle on a scale that defies belief and should feature prominently on every safari wish-list. But what I personally like about this gigantic national park is that even outside of migration season you will still enjoy spectacular year-round wildlife viewing. The wide-open savannahs of the Serengeti are renowned as one of the best places on earth to view Africa’s big cats, especially cheetah chasing down gazelles and impala. The recent reintroduction of five wild dog packs is another key attraction. Wildlife is for the most part well habituated to vehicles and you can happily sit for hours observing a pride of feeding lions or playful cheetah cubs. When asked what my favourite park in Africa is, the answer would have to be the Serengeti. I’ve been privileged to visit the Serengeti many times, at different times of the year and focusing on different areas of this vast ecosystem. No visit is the same, but I’ve never been disappointed. Seeing the wildebeest migration is obviously a highlight, but nothing prepared me for seeing my first river crossing. We had been waiting next to the river for hours. The wildebeest were on the other side and obviously nervous to take the plunge. In the end it was one of the zebras that jumped and that was the start of the most adrenaline pumping spectacle I’ve ever seen. A special place to explore in the park is Gol Koppies. This low grass area is dotted with big boulders or “koppies” and is a favourite hunting ground for cheetahs. Cheetahs can often be found scanning for prey from one of these vantage points and lions love to spread out on the rocks for a nap. Another favourite area is Ndutu in the south. This is where the wildebeest calving takes place in January-February. To drop their calves the wildebeest amass in this area and stay until the calves are big enough to start their first migration. The new calves attract a lot of predators as they are easy prey. Although this is part of the cycle of life, seeing these kills is not for the faint-hearted. I’ve certainly had to take a deep breath on more than one occasion. This world famous reserve is probably my favourite anywhere in Africa. Although it is not scenic in the conventional manner of, say, the nearby Ngorongoro Crater, the flat grassy plains of the Serengeti– plains studded with isolated granite inselbergs – possess an uplifting sense of vastness and space. The game viewing is reliably superb. Lions are abundant, and often seen in prides numbering 15-25 individuals, while the solitary cheetah is very common in certain areas, particular in the south. The central Seronera Valley is one of the most reliable sites in Africa for leopard, and in recent years it has also become a good place to look for tree-climbing lions. Above all, there is the incommunicable thrill of encountering the world’s greatest annual animal migration, consisting of some two million bleating wildebeest, together with a supporting cast of zebra, gazelle, eland, hartebeest, and predatorial hangers-on such as hyena, vulture, and jackal. Unfortunately, the very popularity of the Serengeti means that the central plains around the Seronera headquarters can be a little overpopulated with 4x4s, so for those seeking more of a wilderness experience, it is better to head to one of the camps in the northern and western two-thirds of this vast park - areas where game drives still frequently yield more sightings of lions than of other tourists! Serengeti is less well-known for birds than mammals, but raptors are well represented, and other species to look out for include the dazzlingly colourful Fischer’s lovebird and the endemic grey-throated spurfowl. How do you lose a couple of million wildebeest? It is one of my proudest boasts that I must be one of the only people to be in the Serengeti during the Great Migration (the greatest wildlife show on earth) – and miss it! Don’t get me wrong, I tried. We spent days driving from one end of the park to the other. I did get to see an awful lot of wildebeest and zebra and many other spectacular sites. I had an awe-inspiring ride in a hot-air balloon, skimming over the treetops to watch a hyena hunt and soaring up to 3,000 ft for panoramic vistas. But we never did catch up with those mass, heaving and shoving, National Geographic throngs of animals. Everywhere we went, they’d been the day before. Those animals can shift! And that park is seriously big. The whole Serengeti ecosystem covers around 30,000 sq km (12,000 sq mi), but that also includes the Masai Mara in neighbouring Kenya and surrounding lands that are not part of the National Park, although there are many private game concessions along its borders. The Park itself covers 14,763 sq km (5,700 sq miles). The name means ‘endless plains’ and it’s a pretty fair description. There are some hills and mountains to break it up – this is pretty near the edge of the Great Rift Valley. But basically, it is one vast sea of rolling open savannah grassland, interspersed with the odd stand of woodland, the occasional river or rocky kopje. Across this endlessly circle giant herds of plains animals – wildebeest, zebra, antelope and buffalo, with prowling predators snapping and snarling at their heels. If you can find them, it is a breathtaking sight. Even if you don’t this, this has to be some of the world’s best gameviewing, with some 70 species of mammal and around 500 species of bird, as long as you choose your season carefully and make sure that everything isn’t up north in the Mara. It even has around 100 species of dung beetle! The best time to see predators is from June-October, to see the migration is from December-July. Although it’s a UNESCO World Heritage Site, the Serengeti is constantly under threat, from Masaai herdsman who eye up its grasslands for their cattle and most recently by the authorities who wanted to build a major thoroughfare across the park, cutting the migration route. Talk about the Serengeti almost invariably revolves around the ‘great migration,’ where some 1.5 million wildebeest and hundreds of thousands of zebras and other ungulates follow a primeval circuit in search of grass and water. No surprise, since this is one of the most incredible and, thanks to the annual crossing of the crocodile-filled Mara River that features in countless nature documentaries, best-known wildlife spectacles in the world. But even without this amazing event, Serengeti National Park would still be a contender for Africa’s best safari destination due to its abundance and variety of wildlife. In particular there’s an especially large number of predators: in just one lucky day I saw one leopard, three lions, four cheetahs and seven hyenas. Plus a few black rhinos offer the chance to score the Big Five. The down side to the Serengeti is its popularity. It’s quite common to get stuck in a four-wheel-drive traffic jam in the central Seronera area, the busiest part of the park. While the congestion destroys the wilderness vibe it does offer one significant benefit – the wildlife here is well habituated to vehicles. 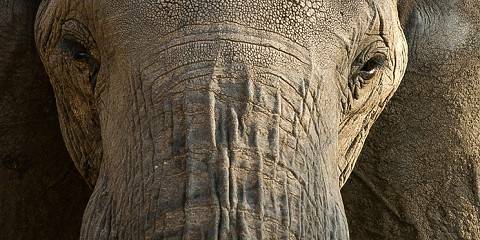 Generally you can escape the worst of the crowds by visiting the west, where the Grumeti River is full of crocs and hippos, and the north, which has the most elephants. Seeing a single lioness strolling along a ridge in the distance without another car around was a more thrilling and satisfying experience for me than seeing a whole pride while in the company of a dozen other cars. Balloon safaris are a popular add-on to the Serengeti experience and, in one of the most exciting recent developments in the safari world, walking safaris and bush camping are now allowed here, albeit on a limited scope. The Serengeti is surely the most famous national park in Africa and nowhere is more synonymous with romantic images of safari. Serengeti translates as “endless plains” in English, an apt description for this enormous swathe of iconic African wilderness. There are few experiences that can compare to watching vast herds of wildebeest marching through the low savannah and wide open landscapes in the south of the park, with nothing but an occasional acacia or giraffe punctuating the hazy horizon behind them. At least in part due to the very ready supply of prey, the Serengeti’s big cat population is second to none. 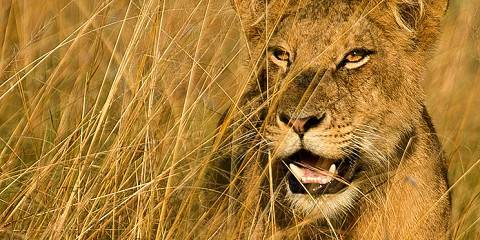 There are an estimated 3,000 lions in the park, more than 10% of Africa’s entire lion population. Over the course of 3 days in the park in March 2015, I would estimate we saw more than 100 lions, sometimes in prides of up to 15. There are also good leopard sightings to be had around the rugged granite koppies that characterize the Seronera region of the park, though this region can get rather busy. For the most part though, considering the Serengeti’s celebrity status, it’s surprisingly easy to get away from the crowds. In the south of the park, we spent at least twenty minutes watching a cheetah and her two young cubs devouring a recently-killed gazelle without a single other vehicle in sight. If you only ever go on one safari, it should perhaps be to the Serengeti. Wildlife is here in abundance, but it’s best known for the greatest wildlife show on earth starring over a million wildebeest frantically racing for their lives on their annual migratory route to the Masai Mara. Every December – April, this incredible sight ensures that the Serengeti remains one of Africa’s most popular destinations. It also ensures brilliant opportunities for predator sightings, as lion, cheetah and leopard follow the herds – I’ve seen several leopards particularly near the Seronera River, dozing in trees in the heat of the day. I’d highly recommend a short walking safari while you’re here – even a brief walk around Lake Ndutu or the Grumeti River gives you a fantastic sense of freedom in the bush, and longer three day walks are also available, eg in the Lobo area, staying in lovely unpretentious bush camps that enhance that wilderness feeling and make a refreshing change from the sometimes unnecessarily lavish lodges or soulless hotels. Of course, this place is more than the migration. It’s well worth visiting the north of the park after the wildebeest hordes have gone – you get the chance to see the prolific resident wildlife in peace and tranquility and without the crowds. And head to the east, to the Soit le Motonyi area, which has recently opened up to tourism, for the best big cat sightings in the park: we saw 57 lions here in just three days! The Serengeti is not only the most famous park in Africa but is commonly hailed as offering the most spectacular wildlife experience on the planet. It is hard for any destination to live up to such expectations but I confess that, on my one visit, this legendary reserve proved to be every bit as impressive as I’d hoped. The sheer sense of space – with the endless sea of grass punctuated by sculpted granite kopjes and crisscrossed by snaking ribbons of riverine forest – was worth the trip alone. And then there was the wildlife: more prides of lion than I have ever encountered anywhere; a leopard with its reedbuck kill slung over a branch; an indignant cheetah chasing a panicked serval from the long grass; a line of eland galloping over the horizon; and, of course, munching zebra, wildebeest and Thompson’s gazelles as far as the eye could see. Yes, I saw plenty of other vehicles, but the place was so vast that they made little impact on my enjoyment. And I hasten to add that I did it the cheap way – on a bog-standard, three-day camping package to the Seronera tourist hub. There are, of course, numerous alternatives, including luxury mobile safaris that follow the migration, and exclusive lodges along the Grumeti River in the western concession areas. The focus of most safaris is the great migration, and you should do your homework to find out where and when to catch the herds. But there is so much else besides, including local specialities such as dik-dik and striped hyena, a pageant of bird life, and a greater variety of habitats – included dense woodlands to the north – than is commonly supposed. Get there any way you can. We’re talking about the Serengeti migration, the year-round spectacle of a million wildebeest and maybe 200,000 zebras chasing the rains on an endless journey in search of grass and water. Come in Jan-Feb to see them massed on the short grass plains in the south of the park. This is where the wildebeest drop their calves, and where the cheetahs and hyenas have a field day. But be aware: when the green season ends the migration resumes and the herds move on. I watched them once at the end of May, streaming away for three days and nights like a retreating army, leaving nothing behind but an emptiness of dust and stubble. With so much meat on the hoof it’s no wonder the Serengeti lions are doing well. Right now there are around 3,000 – perhaps more than at any time in the park’s history. Leopards are also plentiful and I love to look for them along the Seronera Rive where they hang out in the figs and sausage trees. Seronera is a lovely area but there are lots of others, notably the Moru Kopjes, the Namiri Plains and the classic parkland savannahs of the Western Corridor. Heading north from Seronera you pass through monotonous acacia woodlands but it’s worth it to arrive in the Lamai Wedge, the Serengeti’s remote top end on the Kenyan border, with its kopjes and cats and elephant herds. No wonder Myles Turner, the park’s legendary warden, loved this area above all others. But for me it’s the south that sums up the vastness of the Serengeti; an ocean of grass broken only by the beckoning shadows of distant kopjes – and a lion with his mane blowing in the wind. If I had to choose my favourite wildlife-watching destination, I’d probably choose the Serengeti. Where else could I indulge my passion for big cats? On my last visit, for example, I saw more than fifty lions, six leopards and five cheetahs in just three days, not to mention a spotted hyena den and a successful hyena hunt, some of the best savannah scenery anywhere in Africa, and elephants at every turn. And I wasn’t even there for the migration! The iconic kopjes, the famous Grumeti River, the leopards along the Seronera, the sense of light and space and a horizon that never seems to end… The Serengeti is simply unforgettable, a vast place where the seasons bring mass calvings of wildebeests (February), iconic river crossings by wildebeest while crocodiles lie in wait (May to July), and the arrival of massed ranks of wildebeest (December). 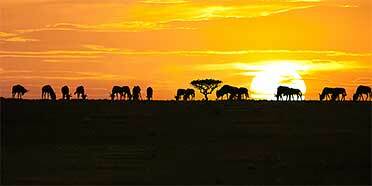 Put simply, the Serengeti is the drama of the East African safari writ large. Open grasslands punctuated with flat-topped acacia trees, big cats striding through beige-coloured undergrowth, the unmistakable outline of a giraffe silhouetted against a gigantic setting sun. If there was ever an African park that lives up to its storybook image, then the Serengeti is it. It is, of course, incredibly popular, and in peak times you can expect to share every major sighting with a handful of other safari vehicles. Opt to enjoy the shared experience, head for a less-visited corner of the park, or take pleasure in seeking out some of the smaller species, particularly the park's five types of monkey. The Serengeti would have to be my favourite safari destination in all of Africa. It is the Lion King brought to life (if only Disney didn’t give the hyenas such a bad wrap)! The Serengeti is breath-takingly beautiful with sweeping grassy plains, stuffed full of wildlife. This reserve is of course synonymous with “the migration” but there is so much more. I have never seen such an abundance of game – so many different antelopes, majestic elephants, more unusual species such as bat eared foxes and serval, and of course the big cats. You stand a good chance of seeing cheetah hunting, you can be lucky with leopards and then there’s the lions. Lots of lions. Every rocky outcrop seems to have its resident pride. If you want to see the migration, tell your travel agent to make sure you go to the right area, at the right time of year. Some short tours just go to the central Seronera region of the Serengeti and may miss the migration.